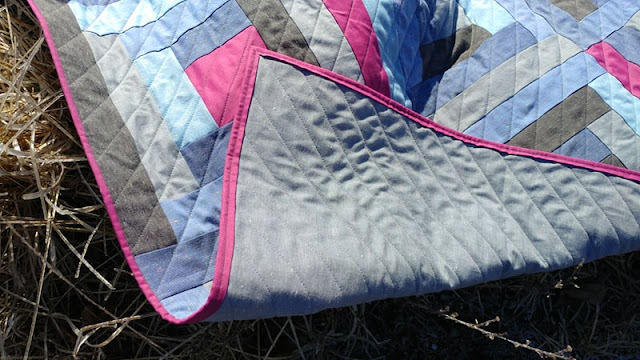 Slice of Pi Quilts: My Chambray Quilt is in Quilty Magazine! The quilt is a traditional log cabin pattern, but made with chambray! 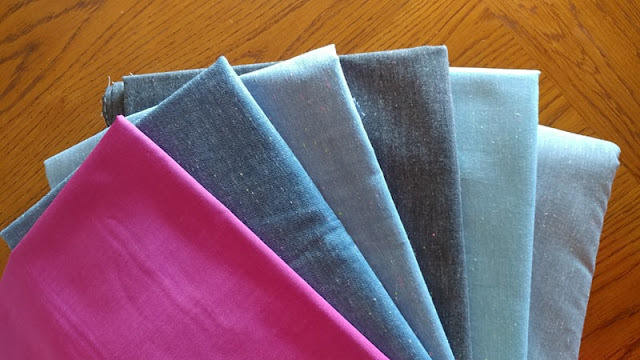 All the fabrics are from Robert Kaufman. The quilt was pieced and quilted with Aurifil 50wt Grey #2605. 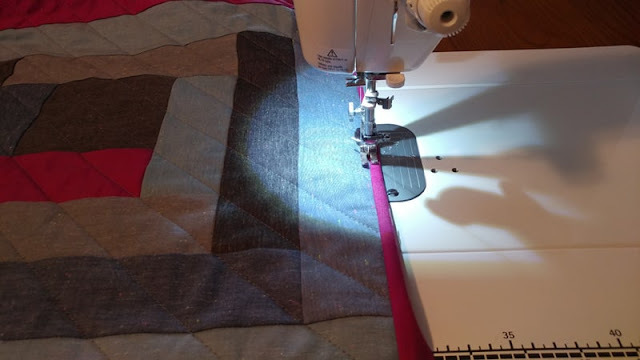 For quilting, I used the walking foot on my domestic machine to quilt straight lines across the quilt. 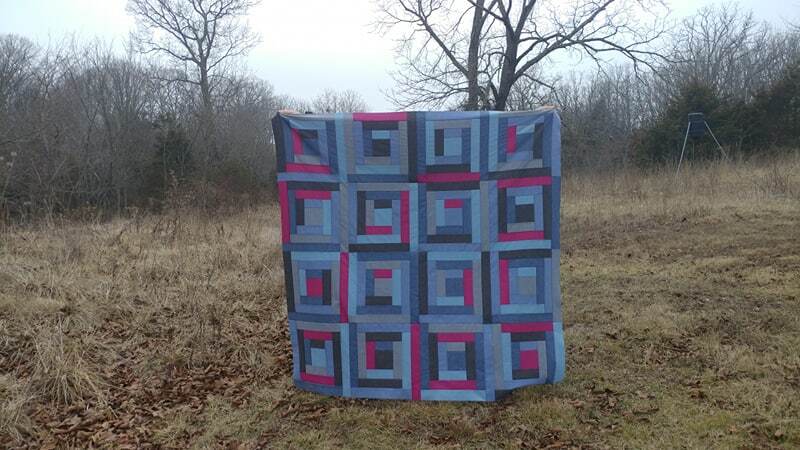 I really wanted to do cross-hatch quilting (quilt the diagonal lines the other direction too), but couldn't squeeze it in before the deadline. 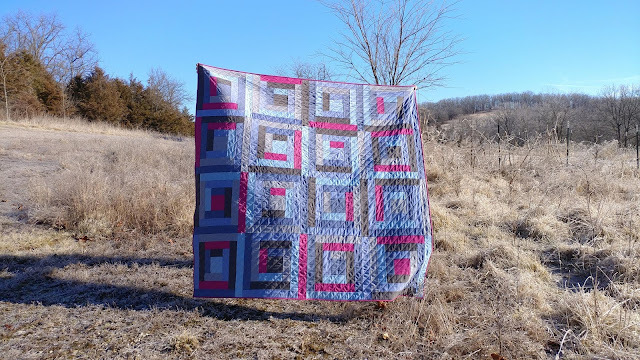 Although the magazine named the quilt "Somewhere in Indiana," all my pictures were taken "Somewhere in Missouri" (aka our frosty yard in February!). 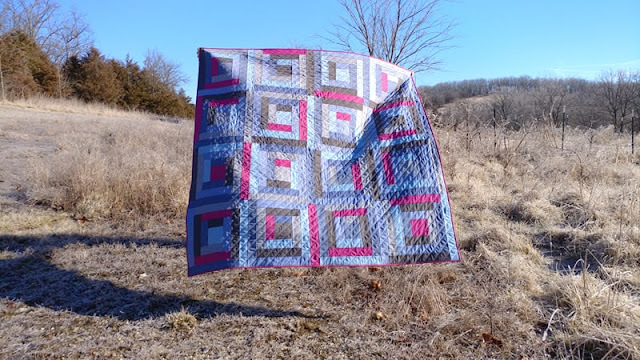 I love the way this quilt feels! The chambray is so soft! A completely different feel than a traditional cotton fabric quilt. I just want to snuggle up in it! The quilt is just barely a cover girl (can you spot it in the bottom left of the cover??). 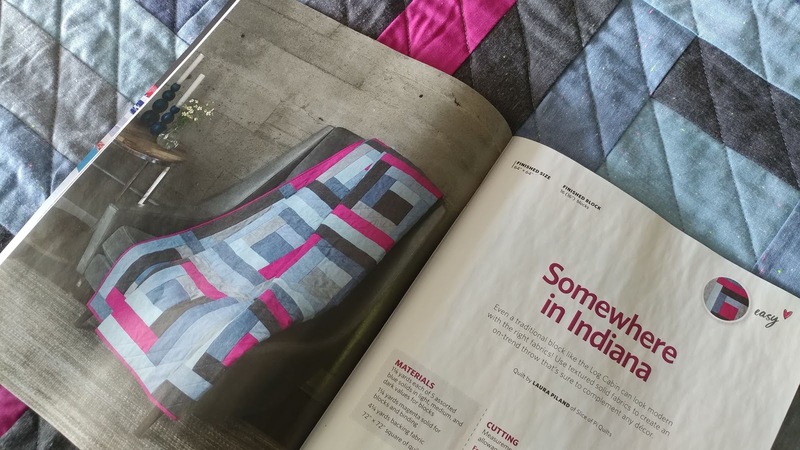 And the quilt makes appearances in the table of contents on page 4, in the actual pattern on pages 12-16, in the "Material Difference" article on pages 18-19, and on the inside back cover where you can buy a kit! The quilt is even featured on the homepage of The Quilting Company website right now! This is my first quilt pattern in a print magazine! (I've had quilt blocks published before - in November 2016, April 2017, and November 2017 - and a pattern in a digital magazine.) And I'll tell you a secret - I have two more quilts in upcoming issues of Quilty too! I will be signing every copy I can find! (They always have Quilty at my local Wal-Mart!) I think I'll leave fun notes inside too! 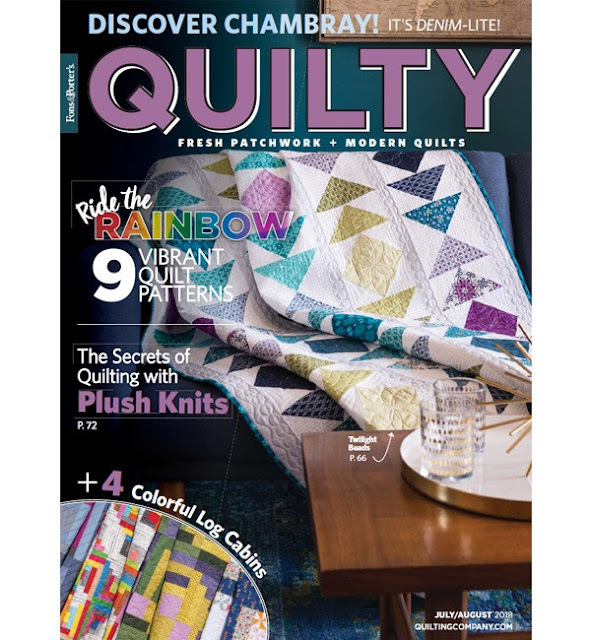 Be sure to pick up a copy of Quilty! If you can't find it locally to you, you can order a print or digital copy on The Quilting Company website. They even have the kit if you want to order that! Linking up with Main Crush Monday at Cooking Up Quilts, Monday Making at Love Laugh Quilt, Linky Tuesday at Freemotion by the River, Wednesday Wait Loss at The Inquiring Quilter, Let's Bee Social at Sew Fresh Quilts, Midweek Makers at Quilt Fabrication, Needle & Thread Thursday at My Quilt Infatuation, Friday Foto Fun at Powered by Quilting, TGIFF at Katie Mae Quilts, and Can I Get a Whoop Whoop at Confessions of a Fabric Addict. Congratulations! It is beautiful. I may need to get some of the Chambray. How exciting to have your first print publication! The quilt is just lovely. It looks like you had just the right amount of wind for stunning outdoor pictures. 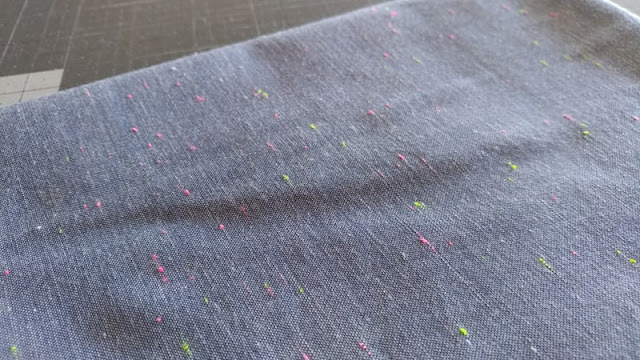 That fabric is fun! I don't think I've ever seen chambray. I'll have to keep an eye out for it. The little flecks of color really add something. Congratulations!!! Great colors...now I'll have to check out chambray!!! Love your quilt, congratulations on the publication. I need to look for this magazine. What a beautiful quilt. I wondered how chambray would work up and now I can tell. Congratulations on being published. In a time when so many print mags are going digital, this is fantastic. Sign every copy you can get a hold of. Congratulations! 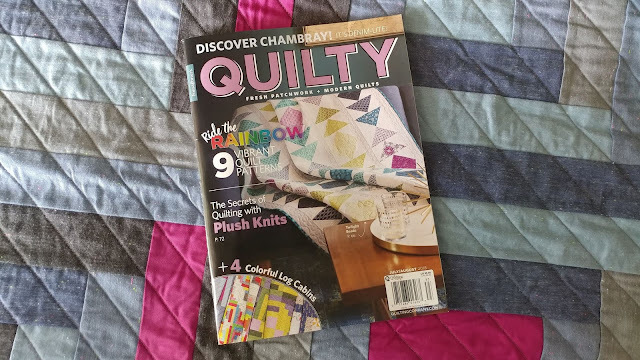 I thought Quilty had been discontinued and it was one of my favourite magazines. So I am happy to see that it still exists and that you have a pattern in it. 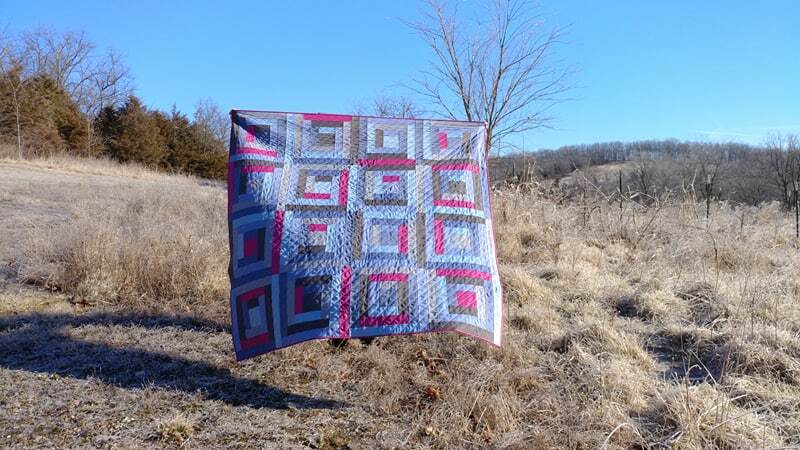 The fabric is really lovely and I like the soft palette with the pop of magenta. That is so pretty! I don't think I've ever used Chambray, but I may rethink that after seeing yours. The colors are amazing and I want that neon dot one so bad now!! And a huge congrats on the magazine! It's always exciting to see it in print!! Lovely fabrics for this, and a perfect name too! Congrats! What a grogeous quilt and that fabric is to die for. I love the specks in that one piece! I would be like you - stealthily going along and signing magazines whereever they are. Congratulations on this publication! Such a beautiful quilt! Love the colours together! And, after looking at it, not only do I want to buy some chambray, I want to buy shares in it. Hope you have lots of pens for autographing. Congratulations on the publication of your first quilt and your upcoming publications too! I wish you great success! Congratulations! I have these fabulous visions of you sneaking into Wal-Mart in a long coat and sunglasses to stealthily sign copies!!! It makes me giggle. Congratulations! I'm smiling at the idea of you sneaking into Walmart to sign your magazine. What a fun surprise for someone. Be sure to leave a note! That would be so awesome to find. Thanks for sharing on Wednesday Wait Loss. Missouri and southern Indiana look pretty similar in February! Gorgeous quilt and yay for all the coverage and a KIT!!! I am totally intriqued with the neon specks+chambray...will have to scout some out for myself! Lovely quilt! Somewhere in Indiana?, perhaps the northern part where I live. Congratulations on being published!